We can’t think of a tastier way to celebrate a birthday than by throwing a Donut party! This baked-good-bonanza has quickly become one of this year’s hottest party trends and it’s not hard to see why. 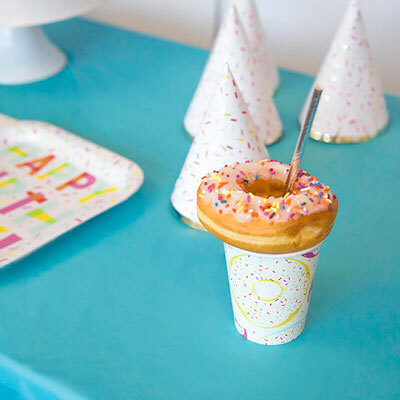 Not only are these donut-themed parties a great excuse to enjoy some treats, but they’re cute to boot! You don’t have to be a kid to enjoy — donut parties are for everyone! 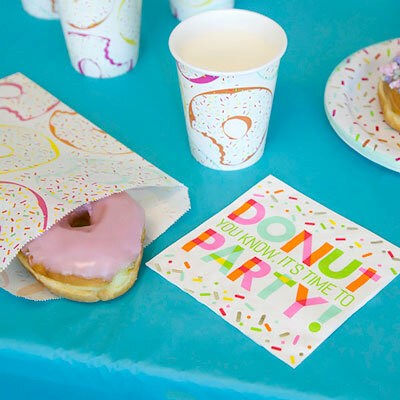 Check out some of our fun donut party ideas to make planning your next party a hole in one. This past week, we took advantage of this new sugary party trend and threw one of our own. If you ask us, the style is in the sprinkles! There’s lot of bright white in this ensemble, from the tableware to the decorations, which allows all the colorful sprinkles on each item to really pop! Plus, the plates and party hats have shiny foil accents that pair well with a set of foil straws. We decided to try a neat DIY project, and we made a party backdrop out of cut up pieces of party streamer to look like sprinkles! This is a quick and easy way to decorate the wall behind the dessert buffet or even to create a photo booth background. Of course, you can’t have a donut party without the signature dessert. We recommend mixing and matching a few different kinds of donuts to make your spread look its best. Strawberry frosted fanatic? We’ve got you covered. Blueberry cake connoisseur? You’re invited too. Coconut nut? Come right on in! 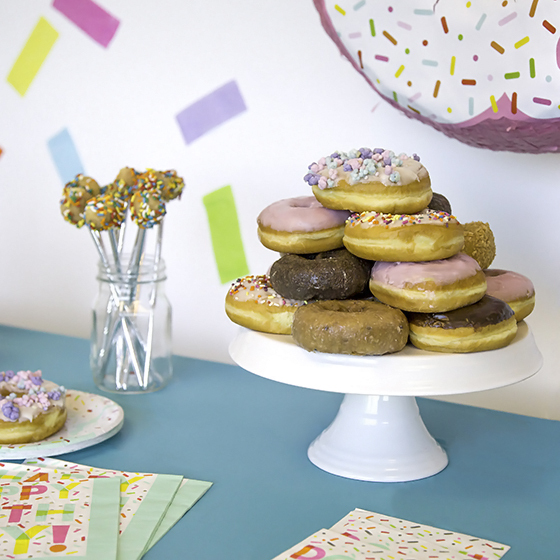 Our favorite part of a donut themed party is all the versatility. And you don’t have to stick to traditional donuts, donut holes are a great option too. We stuck donut holes on our foil paper straws and voilà — donut cake pops! Stick these in a cup or mason jar for a quick and mess-free snack. Finally, make sure to grab a few packs of our Donut Party Treat Bags for guests to take extras home. These glassine treat bags are made with a food-safe wax paper so that donuts won’t stick to the bag. There you have it! A party that’s sure to get everybody’s sweet tooth talking! 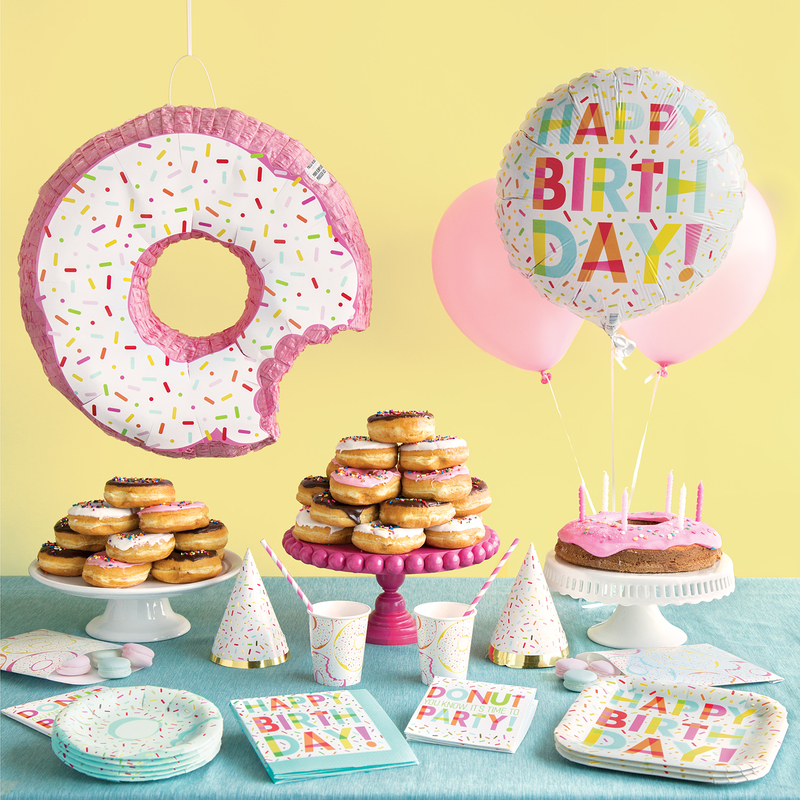 Put the “O” in “Oh, my!” and find our affordable donut party supplies online and in-store! 6305 – Yellow Crepe Paper Streamers, 81 Ft.
6315 – Orange Crepe Paper Streamers, 81 Ft.
6320 – Hot Pink Crepe Paper Streamers, 81 Ft.
6330 – Lavender Crepe Paper Streamers, 81 Ft.
6355 – Lime Green Crepe Paper Streamers, 81 Ft.